Media Options was brokering the Heart.com domain name domain name last year. This past November, Jamie Zoch reported that “Heart.com which was owned by Blucora, Inc. has moved to generic whois data at MarkMonitor, along with a DNS change to generic MarkMonitor servers.” Andrew Rosener of Media Options confirmed the deal to Jamie at the time of his article, but the buyer was unknown. 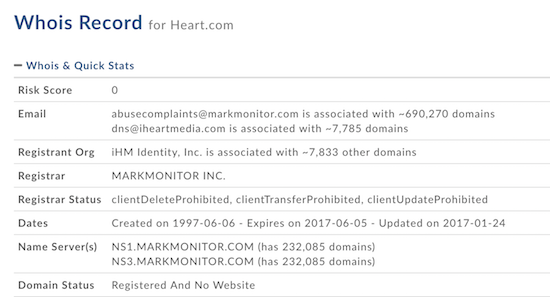 Based on a Whois record update, the new registrant of Heart.com is iHM Identity, Inc., the parent company of iHeartRadio. Heart.com is a great acquisition for the company. In addition to being a fantastic domain name, Heart.com is on brand for the company and it can be used by them for any of a number of purposes – they could even rebrand to Heart if they chose to do so. Owning a generic domain name like this gives them many options. As of this morning, Heart.com is still not resolving, so the planned usage of the domain name is still unknown. Unfortunately the sale price for Heart.com has not been shared publicly, so this sale will not be reported unless one of the parties to the transaction decides to report it. I will check back on Heart.com in a few months to see if it starts being used. And under the severe duress of servicing a crushing debt load. On February 9th, 4 days ago iHeart filed a Form 8-K with the SEC announcing the sale of it’s ClearChannel related trademarks and domain names to a subsidiary. On February 9, 2017, Clear Channel Outdoor Holdings, Inc. (“CCOH”), an indirect subsidiary of iHeartMedia Capital I, LLC (the “Company”), and iHeartMedia, Inc. (“IHM”), an indirect parent of the Company, entered into a Binding Option and Letter of Intent (the “Letter of Intent”), related to the potential sale of certain intellectual property owned by IHM or its affiliates to CCOH. The Letter of Intent grants CCOH a binding option (the “Option”) to purchase the registered trademarks and domain names owned by IHM and its subsidiaries that incorporate one or more of the words “Clear” and/or “Channel,” and any translations or derivations of any of the foregoing, together with any goodwill associated therewith (the “CCOH IP” and such purchase, the “CCOH IP Purchase”). iHeartCommunications on May 11 has again extended private term loan offers, as it did April 13, April 27. The new deadline is May 26.
iHeartCommunications has again extended private term loan offers, as it did April 13, April 27 and May 11. The new deadline is June 9.
heart.com continues to not resolve.